VroomVroomVroom made sure to provide you the perfect car rental in Port Douglas that will complement your holiday needs. Use our booking system and check out the list of available Port Douglas vehicles supplied by major companies like Avis, Thrifty, Budget, Europcar and Hertz. Port Douglas was established in 1877, during the Gold Rush, and ever since it has constantly grown and developed, turning into a unique and welcoming place. Although the township is small it is built to accommodate tourists. Port Douglas was No. 3 on Australian Traveller magazine's list of 100 Best Towns In Australia. Previous names for the town included Terrigal, Island Point, Port Owen and Salisbury. The town is situated adjacent to two World Heritage areas, the Great Barrier Reef and the Daintree Rainforest. Why rent a car in Port Douglas with VroomVroomVroom? We also have pick up locations in and near Port Douglas for your convenience. Book a car hire in advance and avail of cheaper rates. Cancel anytime without paying any charges. We don't charge any booking fees. Our car rental experts negotiated with these suppliers so we can provide the best rates. You are guaranteed of getting the lowest price! You can book a car rental now and pay later. Our friendly customer care experts are always available to assist you. Port Douglas is a small charming town in the far North Queensland, 70 kilometers car drive from Cairns. According to the 2011 census, Port Douglas had more than 3,000 residents. Although it is a small town by the seaside, it is the perfect place to go on a short holiday, enjoy the spectacular landscapes and the clean, lush beaches. Wildlife Habitat provides visitors a chance to experience the Wetlands, Rainforest and Savannah in an open and interactive setting. As you make your way along the boardwalks of the Rainforest environment, you can fully immerse yourself in the different levels of the rainforest – from the forest floor to the canopy and the wildlife which occupy it including the southern cassowary. In the Wetlands, look out for the range of birds and other wildlife that call the area home, including the Black-Necked Storks. Make your way to the top of the elevated Stork Tower and enjoy an unprecedented view of their nest (and eggs, if you're lucky!) 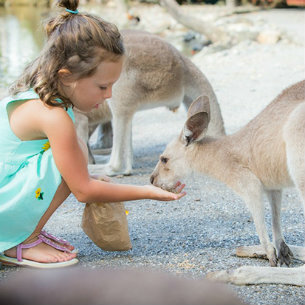 Over in the Savannah Habitat, you will have the opportunity to hand-feed kangaroos and wallabies and admire the endangered Lumholtz's Tree Kangaroos. Back Country Bliss Adventures offers both exclusive private travel experiences, and small group shared adventures, through Tropical North Queensland. Their unique adventures include the one-of-a-kind River Drift Snorkelling tour: taking guests drifting down a crystal-clear rainforest river, searching for the elusive platypus, turtles or river fish below, while electric blue Butterflies flutter above. You may also experience the rainforest from above and below on their Daintree Adventure Day, as they search for Cassowaries, fly through the canopy with Jungle Surfing and look for crocodiles on a Daintree River wildlife cruise. 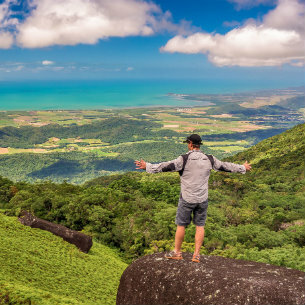 An ever-growing range of bush walks and hiking tours, allow guests to experience the hidden back country of the Wet Tropics World Heritage area; as you search for hidden waterfalls away from the crowds. Tour guides of Back Country Bliss Adventures have extensive knowledge and appreciation of the region, ensure guests leave with a lasting memories and desire to experience more of this great country! The award-winning Daintree Wonder is a fun and professional small group tour company operating in the World Heritage Area of The Daintree. 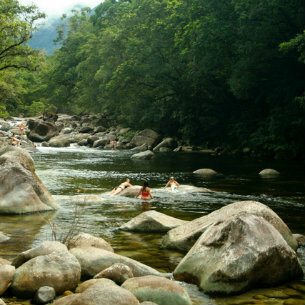 The day starts with a breathtaking walk around the Mossman Gorge and includes other iconic destinations such as Cape Tribulation Beach and the Bloomfield Track. A cooked lunch in a beautiful rainforest setting precedes a swim in pristine freshwater pools. Amazing photo opportunities and a lifetime of memories await you here. The tour ends with an awesome cruise along the Daintree River in search of the elusive estuarine crocodile. The owners / operators are dedicated to conservation and wildlife care and look forward to sharing the magic of the Daintree with you. If you feel like taking a short drive to Wangetti, make sure to visit another award-winning attraction. The Hartley's Crocodile Adventures was established on a 10-hectre World Heritage location and is now a true sanctuary. There are five distinct zones in this wildlife park that are waiting to be explored. Enjoy a boat cruise at Hartley's Lagoon and get a chance to see crocs and birds in their own natural habitat. If you want to see more crocodiles as well as turtles and lizards, go to the Wildlife Discovery Trail. The Crocodile Farm gives you a glimpse of how crocodile farming works. The Cassowary Walk features flightless emblems while the Gondwana Gateway displays unique fauna. 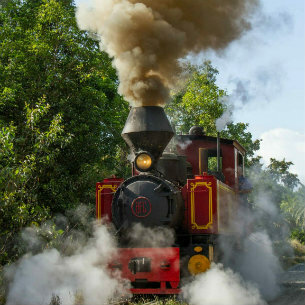 Get on board the Bally Hooley train for an unforgettable ride in Port Douglas. The 90-minute journey lets you enjoy panoramic views of the Harbour and tropical mangroves amidst the stunning Daintree mountain ranges. The train makes a quick stop at the Mirage Country Club and QT Resort before heading to the picturesque St. Crispin's Station. From there, passengers can have a scrumptious meal at Choo Choos cafe while savouring the beautiful view of the lake and gold course. Bally Hooley Steam Railway runs seven days a week until October, 2017. They have three time slots from Reef Marina to St Crispin's and going back. The unique designer resort is set amongst lush tropical gardens and welcomes guests with a contemporary yet quirky tropical vibe. QT Port Douglas boasts of their large lagoon-style pool and swim up bar. Their villas are perfect for accommodating groups and families or for longer stays, offering kitchen facilities and a spacious lounge room with balcony all with garden or pool views. Hungry? Enjoy delicious dining options and balmy evenings with cocktail in hand. The Bazaar Restaurant is an interactive marketplace inspired by international street stalls, souks and bodegas while Estilo gives a fresh take on the modern resort lounge bar. Enjoy the tropical weather and the beautiful surroundings of Port Douglas by staying at BIG4 Glengarry Holiday Park. The perfect time to travel to Port Douglas is between December to March which they also call the “Green Season” because the tropical rainforests come to life with its vivid green colors. However, you can also visit during the off-peak season to enjoy great discounts on accommodation. The new Waterslide is the holiday park's main attraction as well as the jumping pillow. No wonder many families with small children love going here. It is also just 40 minutes away via car hire from Cairns so you can easily check out the city's Esplanade lagoon, shops, restaurants, and movie theatres. If you are looking for a new level of exclusive and sophisticated luxury holiday apartments in the town centre , then drive your car hire to Coconut Grove, which is just a three-minute walk from Four Mile Beach and 5 km from both Palmer Sea Reef golf course and The Wildlife Habitat animal park. This sophisticated apartment offers contemporary 1- to 3-bedroom apartments which come with free Wi-Fi, flat-screen TVs, kitchens, living rooms and bathrooms with whirlpool baths, as well as balconies or terraces with dining tables. Other luxuries consist of an outdoor pool, a BBQ area, a sundeck, plus free parking. 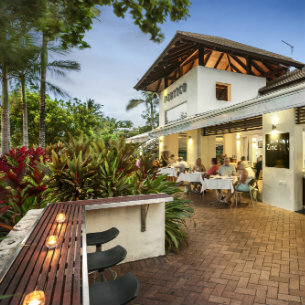 This award-winning restaurant and lounge bar in Port Douglas was established in 2004. Since then, Zinc has become a popular dining and drinking venue amongst the locals. They are known for their fresh local produce, seafood dishes and extensive selection of wines and beverages. They also offer gluten free and vegetarian options to cater to individuals who have a special diet. Their private air conditioned room and beautiful outdoor terrace is the perfect place for group functions and wedding receptions. The room had plantation doors that can be opened on to the terrace to enjoy the tropical atmosphere. Other perks of dining at Zinc include free meal for kids (conditions apply) and free Wi-Fi access. Zinc is open daily from 10am until happy hour. 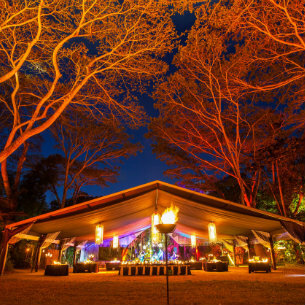 Flames of the Forest is the only rainforest dining experience in Australia so make sure not to miss this once in a lifetime feast for your senses when you visit Port Douglas. Since this magical place is located on a private land in the middle of the rainforest, make sure to call their office to book and organize transfers. They can pick you up from your hotel in Cairns, at the northern beaches or Port Douglas. You can enjoy a glass of wine and not worry about driving back to your hotel. Guests can choose between the Aboriginal Cultural Experience and Rainforest Dining Experience. Enjoy award-winning menu and world-class entertainment. This place is also ideal for weddings because of its romantic and magical setting. Reef and Rainforest Coast is a spectacular 200 kilometers stretch of Coral Sea coastline. The coast has a distinctive laid back atmosphere and a low-rise tropical old charm. Here, you can rent a water-jet ski or a boat and enjoy the clean blue water and the breathtaking coral reef. It is the perfect place to drop your car hire and spend a lazy afternoon under the sun. Cotters Markets are open every Sunday between 8 in the morning and 1:30 after lunch. Hop in your car hire and witness the markets that offer a wide array of local arts and crafts: from pottery, embroideries, jewelry, to rugs and carpets. The markets are the reflection of the local people, such as artists, farmers tradesmen and craftsmen. It is the one place where you can find the perfect bargain of holiday gifts for your friends and family. Kite-surfing Port Douglas is a wonderful place to hire and practice this particular sport, especially during the winter and summer months, when the wind is powerful enough for kite-surfing. Rainforest Habitat Wildlife Sanctuary Port Douglas offers tourists the chance of visiting and experiencing four different environments in one place: the rainforest, the grasslands, the woodlands and the wetlands. Here, you have the chance to see over 180 species of animals and insects. Bring your car hire and learn that both children and adults will love coming here, because it is both educational and entertaining. Avis Port Douglas - 7 Warner St, Port Douglas, QLD. Budget Port Douglas - 7 Warner St, Port Douglas, QLD. Thrifty Port Douglas - 50 Macrossan St, Port Douglas, QLD.